This is the dead of summer and it’s hot, humid, and you don’t feel like cooking. What snacks can you prepare that are easy, nutritious and tasty? I’ve got a few ideas that will make your life a little easier. Check back every week for a new healthy summer snack. These vegetable kabobs are a healthy food and perfect for the summer. They’re full of nutrients, fiber, and low in calories. 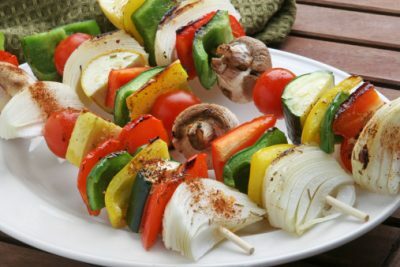 Slide alternating pieces of vegetables and fruit on each skewer. Gently brush with extra virgin olive oil. Grill on medium heat until golden brown. Serve and enjoy! “100 Calorie Healthy Refreshing Summer Snacks,” Huffington Post web site, July 12, 2013; http://www.huffingtonpost.com/2013/07/12/100-calorie-healthy-refreshing-summer-snacks_n_3535102.html?utm_hp_ref=healthy-living, last accessed July 15, 2013. Cain, L., “10 Healthy Summer Snacks,” Spark people web site; http://www.sparkpeople.com/blog/blog.asp?post=10_healthy_summer_snacks, last accessed July 15, 2013.